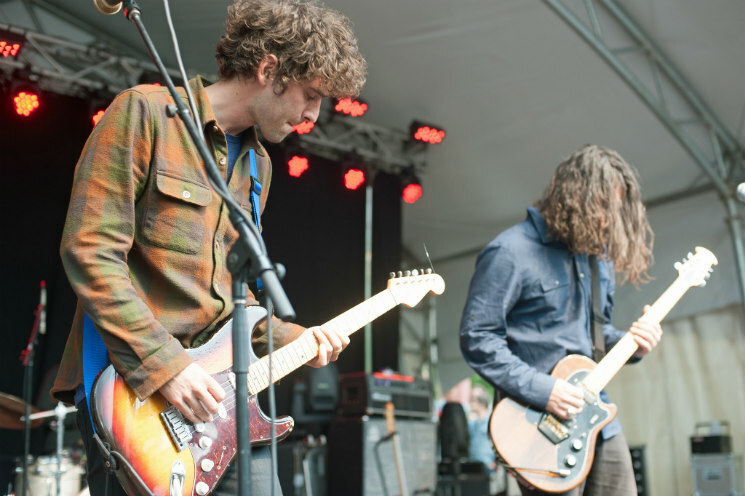 Montreal's SUUNS brought dissonant dance rock to Olympic Plaza yesterday afternoon (June 25), the tension and release of their music fitting the unpredictable bouts of rain that fell during their set. Comprised of lead singer/guitarist Ben Shemie, guitarist/bassist Joe Yarmush, drummer Liam O'Neill and keyboardist Max Henry, the band mixed organic sounds with stark, detached electronics. SUUNS played from their recent album Hold/Still, a contender for this year's Polaris Music Prize. Their songs were ominous, but danceable beats kept the crowd moving through the gloom. Drummer O'Neill played rhythms reminiscent of Sarah Jones (of Hot Chip and NZCA Lines). Shemie's vocals were delivered menacingly, as the music sometimes headed into dirge and drone-like territory, but it was a keen sense of melody that carried the band, allowing them to connect to the audience. SUUNS are making unique music on their own terms, and their weird yet enjoyable performance succeeded in engaging the audience.